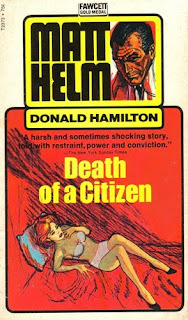 As discussed in a recent video, I've decided to start reading and collecting Donald Hamilton's "Matt Helm" book series. Hamilton wrote 27 novels in the series (plus one more that was never published) between 1960 and 1993, all focused on the exploits of an American counter-espionage agent. The novels are written from first-person perspective, and allow us to get inside the head of our hardened hero...or anti-hero, as it may be. They were originally published by Fawcett Publications under the Gold Medal label. In this inaugural entry, we're digging into the very first Matt Helm novel, 1960's Death of a Citizen.